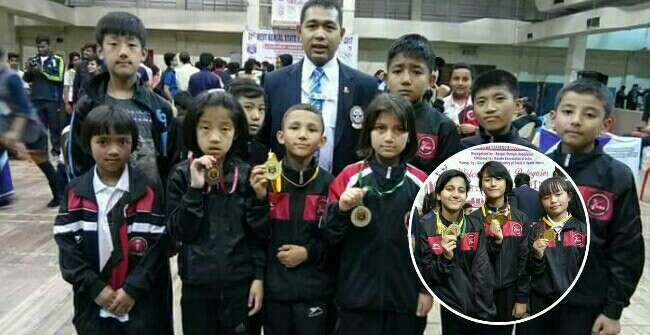 Kalimpong Sports Karate-Do Association (KSKA) Kalimpong District Team successfully participated and bagged 4 Gold, 4 Silver and 10 Bronze Medals in 21st KAB West-Bengal State Karate Championship 2017 held at Khudiram Anushilon Kendra, Kolkatta. Team Kata 14-17 year girls Team kata became Champion and won Gold by Ms. Esha Gurung of Girls Higher Secondary School, Ms Yschna Chhetri of Vrindavan School and Ms. Ajanta Mukhia of St. Joseph's Convent. Mr. Rohan Rai of Paramount School, Kalimpong. We would like to convey our heartiest Congratulations to medalist players of KSKA and specially wish you all the best to selected players for KAI Under 21 National Championship 2017 which will be held from 10th -13th May 2017 at New Delhi.